Early recognition and control of weeds invariably leads to considerable savings in the cost of herbicides used on crops and in gardens. This atlas is an indispensable full colour photographic guide to the 40 most common weeds afflicting arable farmland and gardens. The weeds have all been photographed at cotyledon and seedling stage to permit early identification and control. Accompanying line drawings highlight major features and calendar germination and flowering times. Early recognition and control of weeds invariably leads to considerable savings in the cost of herbicides used on crops and in gardens. This atlas is an indispensable full colour photographic guide to the 40 most common weeds afflicting arable farmland and gardens. 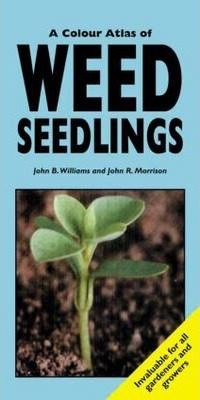 The weeds have all be photographed at cotyledon and seedling stage to permit early identification and control. Accompanying line drawings highlight major features and calendar germination and flowering times. Practical yet systematic layout to aid identification...good colour photos...printed for use in the field....should find a place in the jacket pocket of students, growers and farmers alike.